Gaze thoughtfully at vintage photographs of book-lined rooms. 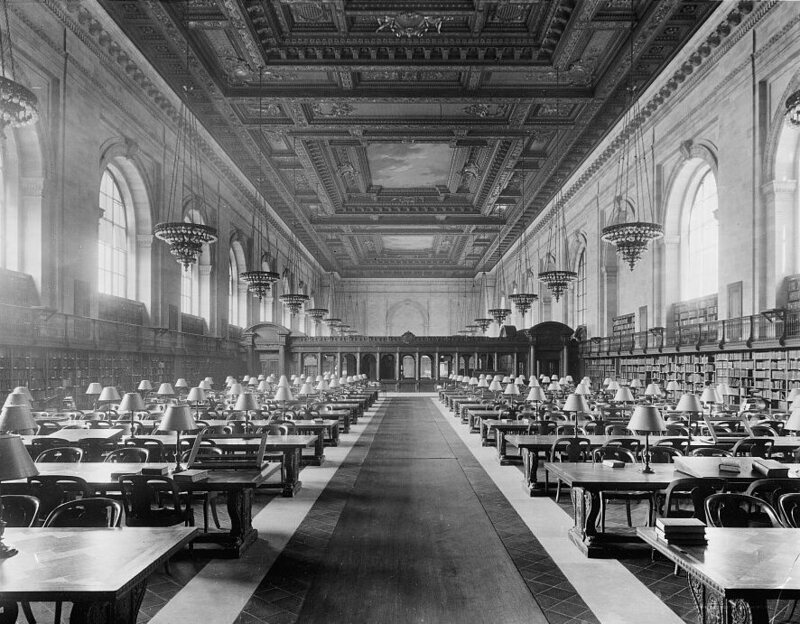 Public libraries as we know them in America – government-funded, free to access – have existed since the 1800s. The Boston Public Library was the earliest large-scale library, with 16,000 items available to borrow when it opened its doors in 1854. In the second half of the 19th century, philanthropist and notable library-lover Andrew Carnegie donated a fortune towards libraries. He believed they would “bring books and information to all people”. His gifts resulted in 2,509 Carnegie libraries around the world, with 1,689 in America. The wealth that Carnegie and others like him donated to libraries was evident not just through the purchasing of books, but how they were housed. Before it even opened, Joshua Bates gave $50,000 to the BPL for a new books, provided “the building shall be such as to be an ornament to the City, that there shall be a room for one hundred to one hundred and fifty persons to sit at reading tables, and that it be perfectly free to all.” Some 40 years later, the magnificent Bates Hall opened. Today, there are just over 9,000 public libraries with around 16,500 branches across the United States. In 2014, BPL alone lent 3.7 million books and hosted 10,000 public programs. Access to a public library provides not just infinite reading material, but also internet services and a sense of community. Many libraries offer classes and events—everything from children’s story time to resume writing tutorials.